Archaeologists for a day, We learn and practice, in an area specially equipped stratigraphic techniques and all phases of a campaign of archaeological excavation. 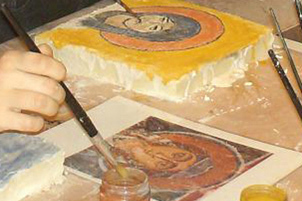 They breed on rock blocks and following the fresco technique in all its phases (preparation of ’ plaster, cartone, spolvero, pittura) pictures of the Rupestrian churches of Matera. Using vegetal elements: galle, leaves, flowers and roots you experience dyeing techniques practiced in the past. Construction of stools in ferula to discover the skills and knowledge of our "fathers" pastors. All stages are made from grain of wheat to bread leavening and finally eat the product of their work. From milking to the formation and breakage of the rennet to reach each with their own hands at cheese production. It includes "reciting" the complex life of a beehive, the observed directly and, with beeswax, each participant makes his candles using various techniques. All phases from the olive harvest to milling until oil production, to understand the historical and nutritional value of a product of our land and smell of the mill. Games and worksheets on different cultivars of olives. Starting from paper thrown into the waste basket, producing recycled paper fun, White and colored using various techniques. Realizzare, giocando, Le fasi of the recovery of the vetro, until the new objects to understand the importance and practicability of recycling, stimulate the imagination and express their creativity. Through games and equipment are carried out a series of experiments on physical and chemical characteristics of the water to reflect on the importance of water for the planet and on the problems of pollution and management. In a match game-lesson dealing with the following themes: particle size analysis, study of chemical-physical land, macroscopic and microscopic features, the karst, the fossils. Observations on the territory and a series of small experiments, games and buildings to reflect on the production, use and transformation of energy. After an introduction in the classroom to provide food and basic elements of photographic technique, students go to the active observation of the area or territory of reference, in the role of a photojournalist, committed to tell it through the photographic image. If you select photographic images relating to specific topics and will act on it using a graphics program. Exercising and developing observation skills, aesthetic taste and computer skills to compose a photo story. Can be combined with all meeting "educational workshops" and "discovery paths". Looking back on the experience through photographs taken by participants themselves, fight and capture the basics of photographic technique and processing of images using a graphics program. * THE MEMORY TREE In one or more meetings and outings, a cardboard tree is personalized with photos, notes and items that everyone collects in its memory poking, in memory of his family, in memory of the city to enhance the memory of all.